Do you have uneven or sunken concrete? Have you received a city violation for an uprooted sidewalk? Does your garage floor show signs of settling? 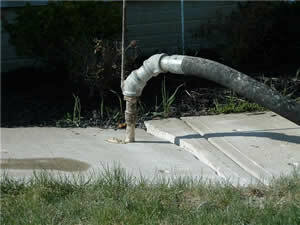 Has your concrete porch settled causing water to gain access to your basement? All of these problems can be rectified and corrected with our leveling process. Our local climate varies greatly. These varying temperatures result in freeze/thaw cycles that can cause improperly installed concrete to heave and lift. In addition to these freeze/thaw cycles, tree roots, water erosion and inadequate installation also can be contributing factors to concrete settling, lifting or even cracking. In some instances, a lack of the settling of the concrete slab can cause many various hazards as well as poor drainage. You can be confident in Saint Louis Metal Work, as all of our work is bonded, insured and guaranteed. We are proud members of the Better Business Bureau and local Chamber of Commerce. A pattern of 1″- 1 3/4″ holes are drilled throughout the sunken concrete slab to assure all space is filled. These holes are then filled with a special material that is pumped below the existing concrete slab. The material is then hydraulically pressurized and the slab is raised to the desired precise height. Once the lifting operation is complete, the holes are then backfilled with concrete. We offer a two-year guarantee on all our leveling projects.